Common terns are legally protected in New Hampshire. Possession and take (which includes harming, harassing, injuring and killing) is illegal. Distribution: Southeastern NH: Great Bay, Hampton Harbor, Isles of Shoals and along the seacoast. Description: 13-16” in length. Light gray on top, white underneath and a black cap on head. Deeply forked tail and pointed wings are visible during flight. During the breeding season the bill is red with a black tip. Commonly Confused Species: Roseate tern, Arctic tern and least tern. Habitat: Common terns nest on rocky islands, barrier islands, and salt marshes that are close to feeding areas and that provide protection from predators. Common terns nest in the open, on bare ground, or on vegetation. 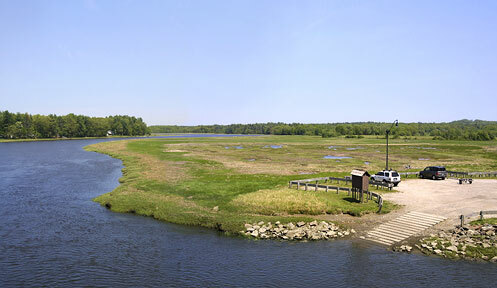 In New Hampshire, the majority of common terns nest at the Isles of Shoals on Seavey Island, with a peak of 3,212 pairs nesting there in 2003. Small numbers of common terns have also been documented on islands in Great Bay in the last 30 years however, these areas are subject to more predation and human disturbance. Common terns historically nested in the Hampton Harbor salt marshes with a peak of approximately 50 pairs in the 1970’s and 1980’s. These numbers have continued to decline and fewer than 25 pairs remain. A small population also inhabited Back Channel in Newcastle dating back at least 50 years. This site was abandoned in 1998 after the Seavey Island colony was established. 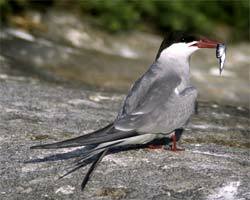 Life History: Common terns arrive in NH during April and May each year to breed. Each nesting pair lays 2-4 eggs during late May through July and both the male and female take turns incubating the eggs. After approximately 21-27 days the young hatch and approximately 28 days after hatching the young chicks are able to fly. The tern colony on Seavey Island at the Isles of Shoals consists of a combination of primarily common terns and also some Roseate and Arctic terns as well. Common terns leave NH during August when they migrate south to their wintering grounds.